There are three possible trailheads. 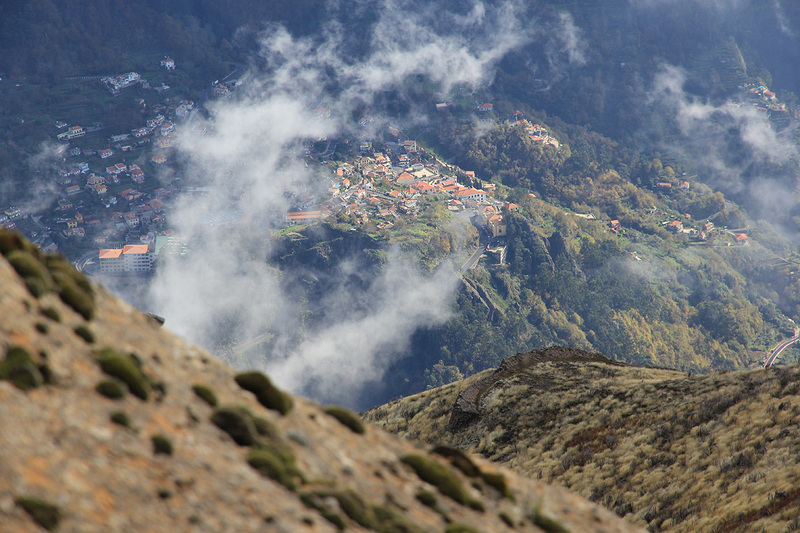 The most direct starts from the valley with the village Curral das Freitas. 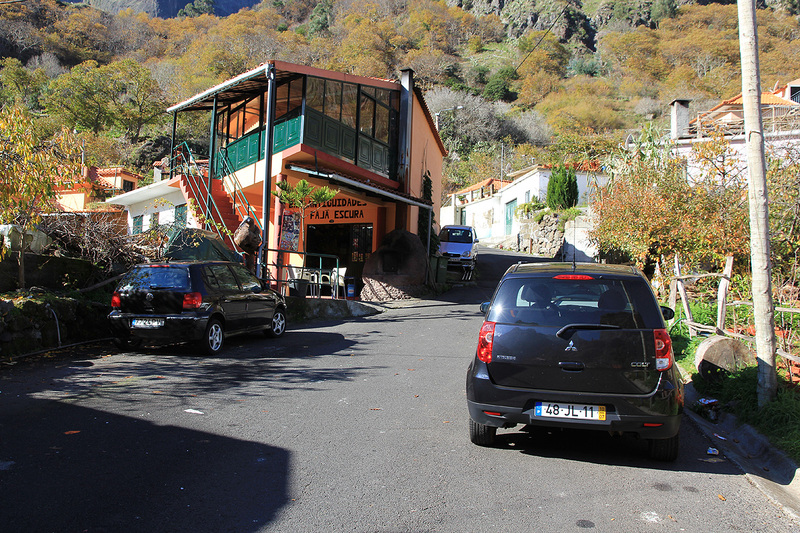 Drive uphill, generally north-west (sort of left) from Funchal, and locate a road with signs for Freitas. (Use a map to help locate the road, unfortunately, the road number, ER-107 is almost never seen. This road climbs a big hill and you will drive through a traffic circle serving a tunnel from your right hand side. Higher up, there is a more than 2 kilometer long impressive tunnel. You exit this tunnel and turn left, downhill. 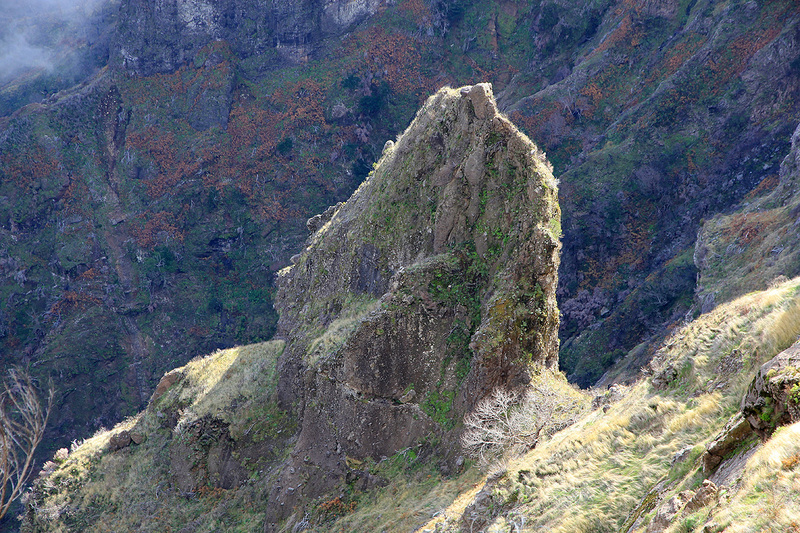 This valley, quite a hidden place, is located below the highest mountains of Madeira, forming a semi-circle around it. Follow the main road as it descends through the village. At the lower end, there is a road fork, turn right here. This road serves the inner (more north) part of the valley. About 1.5 kilometer from the road fork in Curral das Freitas, you cross the river and the road forks again. Take the left fork, this road runs uphill and eventually turns right. Find parking here, this is the trailhead, location N32:43.905, W016:58.261, elevation about 645 meter. Continue up the road. The road soon narrows and turns into dirt. Continue uphill in the same track. What is now a primitive forest road enters some sort of ditch as it gradually curves left. Pay attention, since the trail exits from this road and climbs out to the right side. There are some sign/paint and an arrow (pointing right) saying Pico Grande. The trail zig-zags uphill and is clear and easy to follow. There are interesting landscape features along the route. 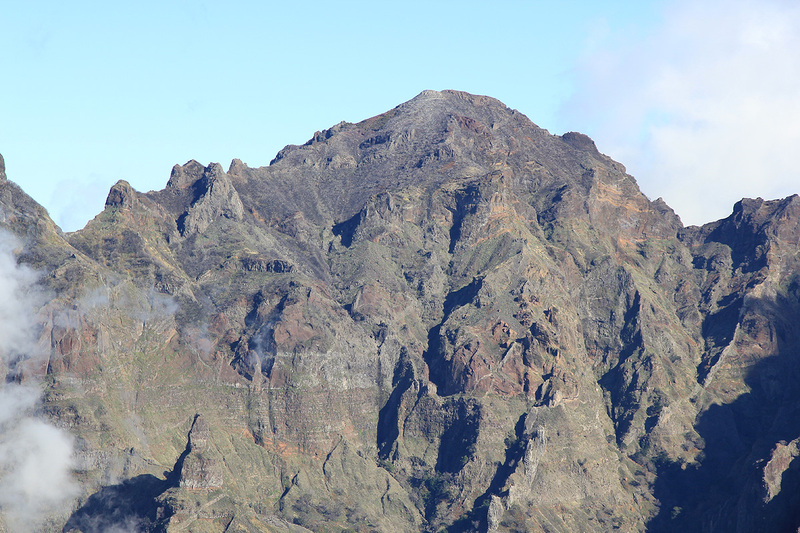 You can see the summit of Pico Cerco towering above you. 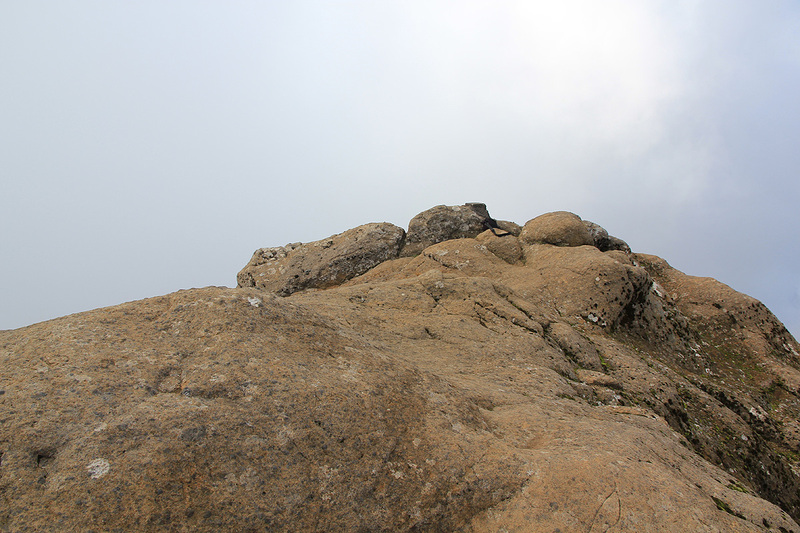 Higher up, you finally gain a very characteristic ridge, location N32:43.975, W016:58.754, elevation about 1145 meter. 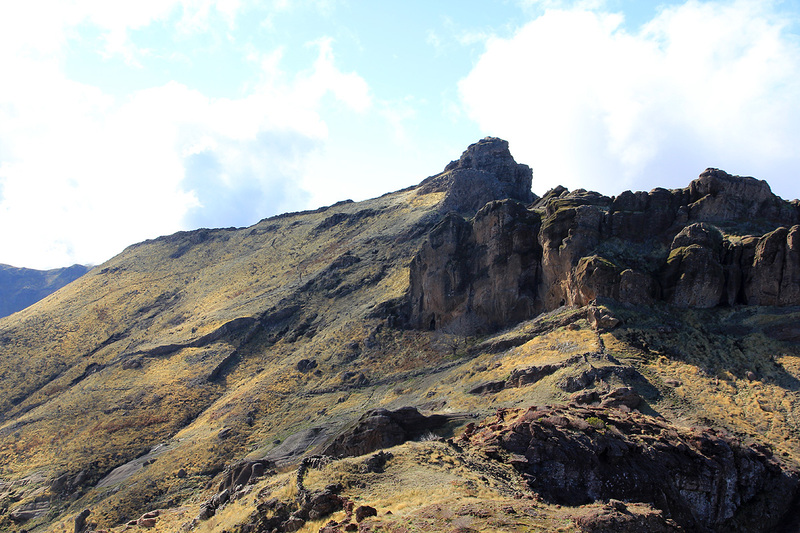 The next section is protected by cable, but easy to negotiate as it climbs somewhat steeper before making a long traverse left in order to gain the main dividing ridge at location N32:43.844, W016:59.132, elevation about 1322 meter. Pay attention here, as the trail to Pico Grande forks sharply right just as you gain this divide. 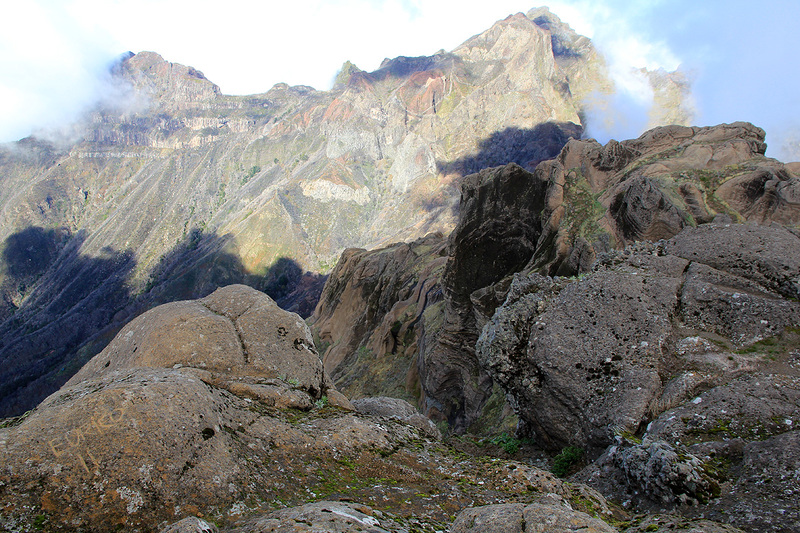 The trail traverses onto the broad east facing slopes of Pico Grande, first vi a slightly steeper section protected by a cable. Higher up, there is a new, unsigned trail fork. The left fork (going straight uphill) serves Pico Grande while the right fork will take you to the saddle between Pico Grande and Pico do Cerco. 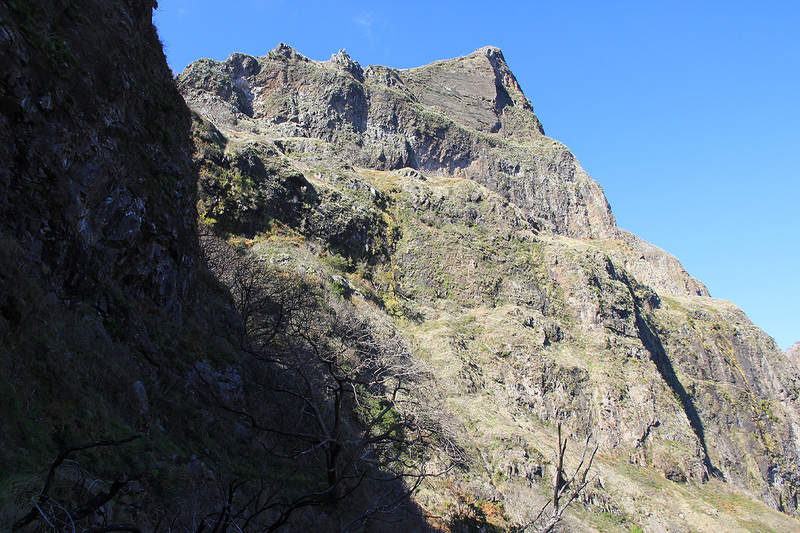 The final summit block is steeper, but there is a pretty obvious route. This section is (YDS) class 3, but only for a couple of relatively easy moves. A very nice summit commanding an exceptional view. I started out at 1150 after asking at the local bar that this was indeed the proper trailhead. They confirmed this, but warned me that it would be at least a 5 hour hike. The trail was nice and well developed, I made good time as I got up on the main crest in slightly less than one hour. 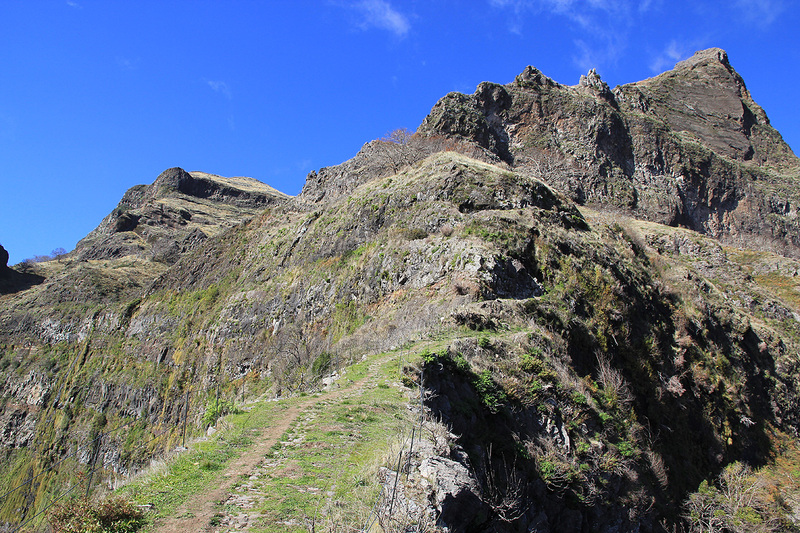 The trail to Pico Grande forked sharply right and higher up there was a second trailfork with no signs. The horizon to my left was close and the cone shaped summit further right looked higher. I took the right branch and hiked towards the col separating the two peaks. Once there, I realized that my target peak was most likely left, however having made it this far, I decided to climb the nicely shaped peak. 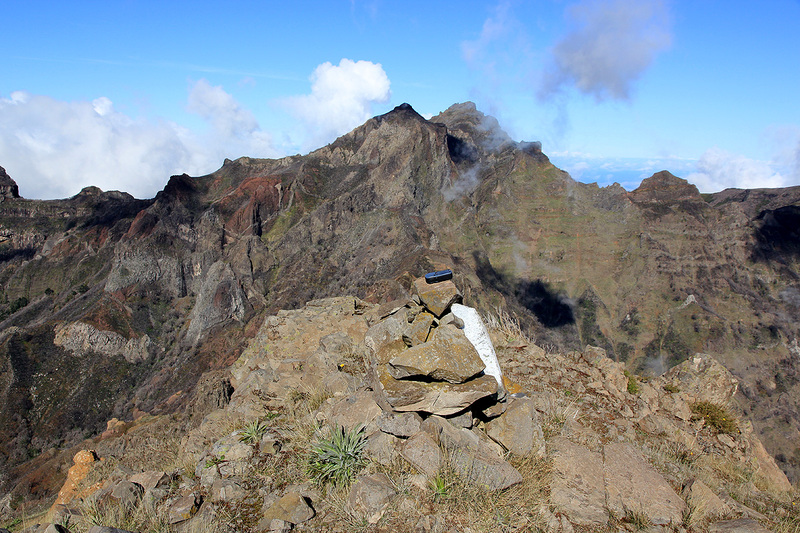 I summited Pico do Cerco 1620 meter, at 1320, just 1:30 after leaving my car. It was now obvious that I had bypassed the highest peak. 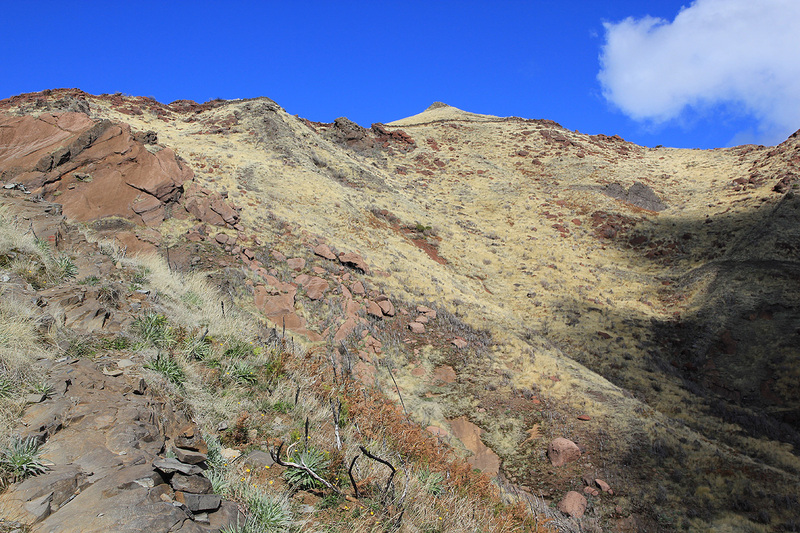 I traversed back and found a trail that traversed up the slope and joined the main trail just below the summit area. From here, a few minutes and I was at the base of the summit block. Many people had obviously climbed it and it was easy to follow the route. A few (YDS) class 3 moves and I was on top. Thus, this route is really (YDS) class 1 all the way except at the very top. I rested and looked around at the nice scenery. 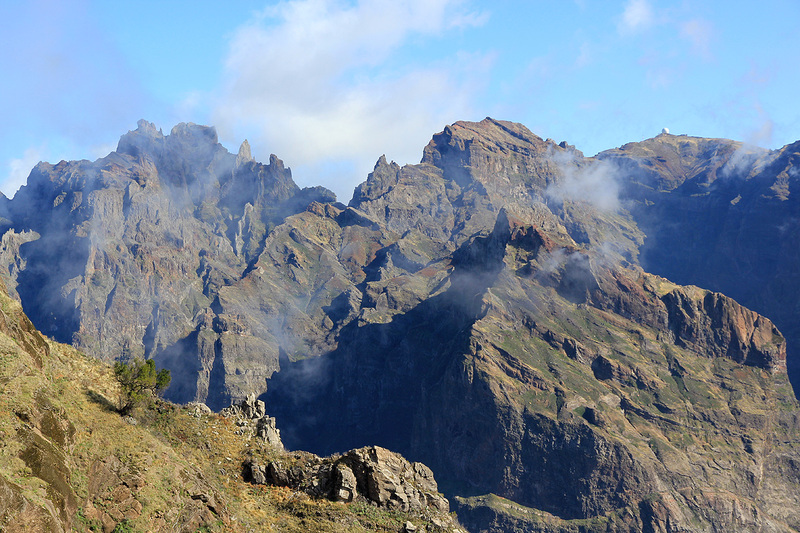 The peaks between Arieiro and Ruivo are and look pretty wild. 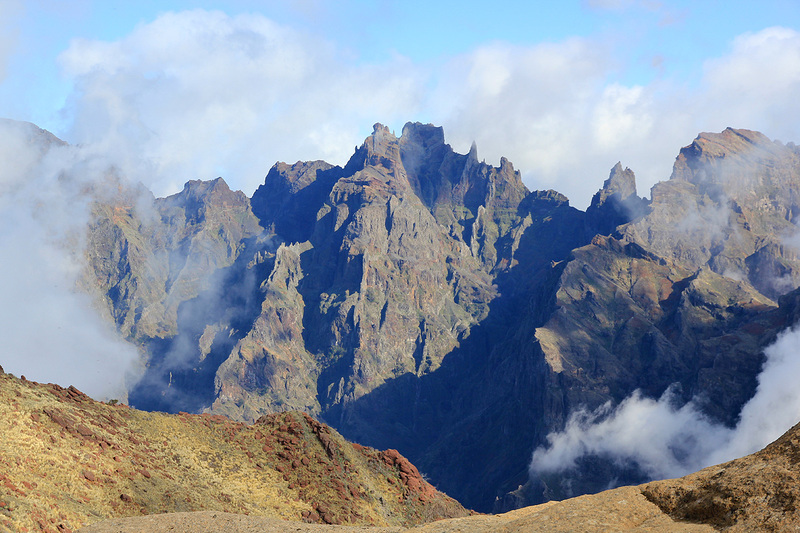 Towards the north, you see the peaks along the traverse from Pico Ruivo to the main col Boca Encumeada. I could also see across to the wind mill area further west and directly into the hidden valley below. I left the summit at 1350 and hiked back down without much to report. Back at the car by 1450, thus exactly one hour for the descent. 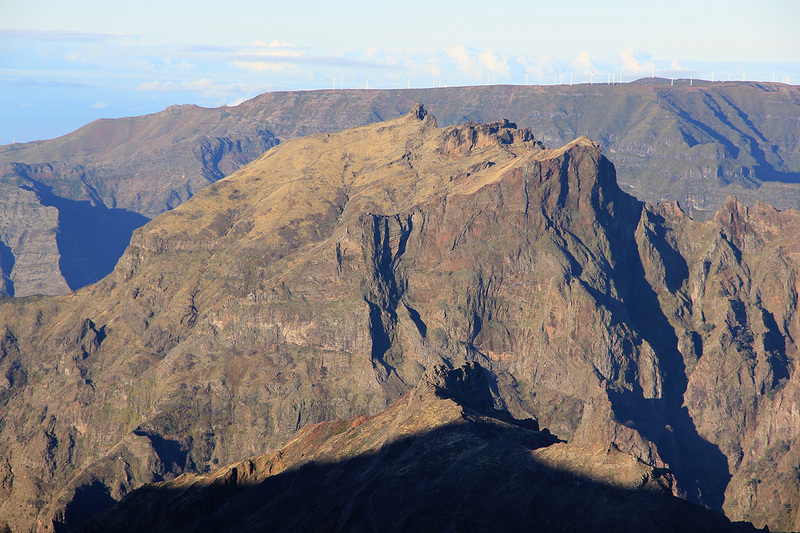 Pico Grande, and Pico do Cerco further right. 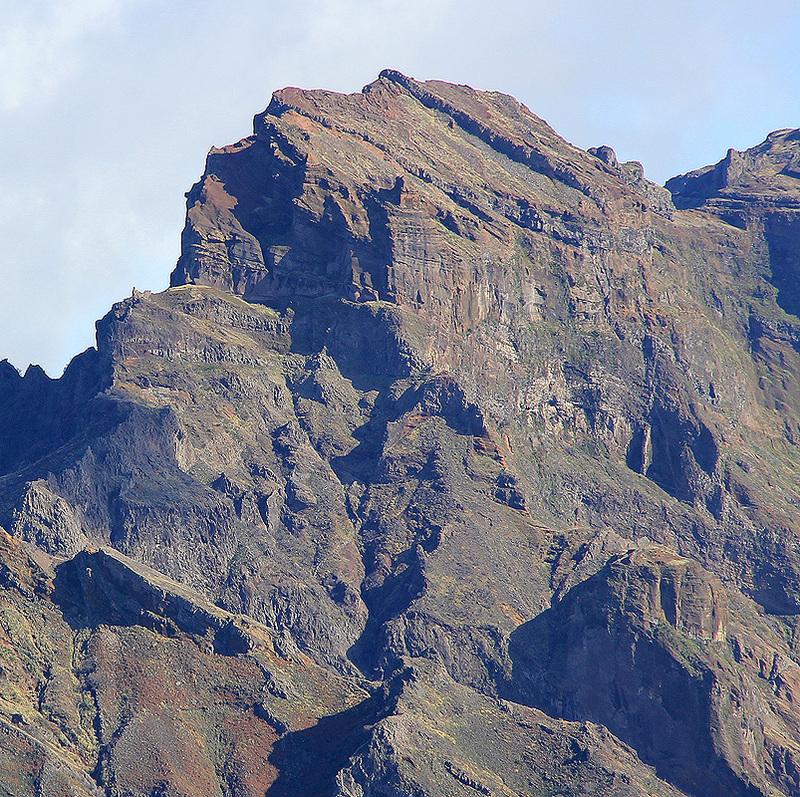 View to Pico Torres and Pico do Cadrao. 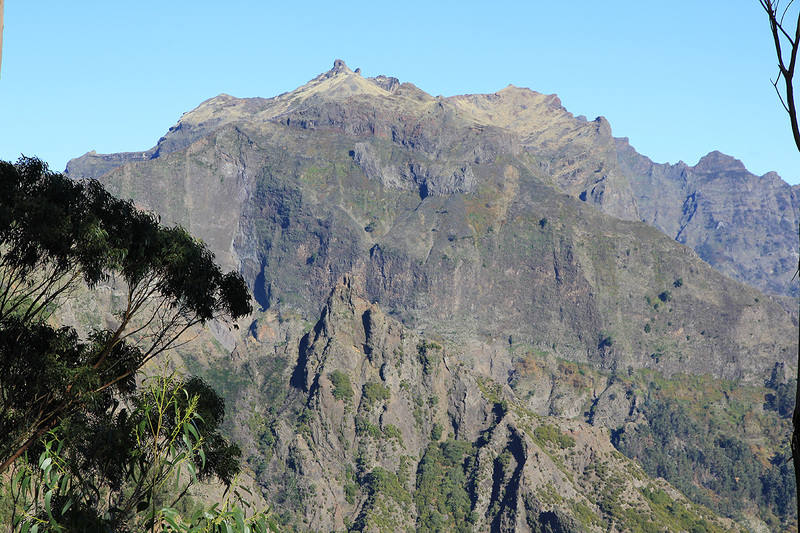 Pico Grande and Pico do Cerco, as seen from the Arieiro to Ruivo traverse.